Two scouts and a third-base coach expertly prepared the Royals to take on David Price, Jose Bautista and the Toronto Blue Jays and the result was Kansas City's second consecutive American League pennant. KANSAS CITY—Players don’t win championships. Organizations do. That truism never was more evident than in demonstrating how the Kansas City Royals repeated as American League champions with a thrilling, one-for-the-ages, tell-it-to-the-grandkids-one-day 4-3 win over Toronto in ALCS Game 6 on Friday. Lorenzo Cain really did make like Enos Slaughter to score the pennant-winning run by scoring easily from first base on a single with no outs on a play when he was not running with the pitch. (Do yourself a favor and read that description again—slowly. Amazing. You will never see such a play again.) And Wade Davis did channel Mariano Rivera of the 2003 ALCS with one of the most clutch relief performances you ever will see. But what you didn’t see was how three guys in their mid-50s who haven’t played a major league game in years, if ever, helped the Royals beat the Blue Jays. Think of the diligence and intelligence of Tim Conroy, Paul Gibson and Mike Jirschele as small pieces of a jigsaw puzzle: easy to miss, but the picture isn’t complete without them. With their help, the Royals knew when David Price was throwing his changeup and when he would not throw to first base on a pickoff and where Jose Bautista would throw the baseball if he fielded it far to his left. Start with the most important inning of the series: the seventh inning of Game 2, when Price had mowed down 18 straight batters and held a 3-0 lead nine outs from evening the series at one game each. The popular narrative that came out of this game was that a pop fly by Ben Zobrist that fell between Bautista, the Toronto rightfielder, and second baseman Ryan Goins was the biggest play in the game. Poppycock, as the British might say. Price still had a three-run lead, a runner at first, and the Royals were not making hard contact. It’s what happened in the next six batters that turned the series. First, Cain singled to rightfield. Then Eric Hosmer hit a 1-and-1 changeup for a single to drive in Zobrist. Then Hosmer took off running on a shocking steal attempt against Price, who had thrown the most innings in a season without allowing a stolen base since Luis Tiant way back in 1968. Hosmer’s break prevented a grounder from Kendrys Morales from becoming a double play. As Price saw Hosmer slide safely into second base on what he thought was a sure double play ball, he threw his arms up in the air in disbelief. Cain scored on the play. The Royals, down 3-2, now had Hosmer at second base with one out rather than two outs and the bases empty. Mike Moustakas then laced a 2-and-2 changeup to rightfield for a single to send Hosmer home with the tying run. Price recovered to whiff Salvador Perez to preserve the tie. But then Alex Gordon drove a full-count fastball for a double to score Moustakas with the tie-breaking run. The Royals would go on to win, 6-3. I replayed the inning in my head. Moustakas was all over a 2-and-2 changeup from Price—a good pitch that was down and away but that didn’t fool him either. Wait—how many times did Price even throw a 2-and-2 changeup to a lefthanded hitter all year, as he had done to both Gordon and Moustakas? The answer was just 10. Then I thought about the Hosmer at-bat: a 1-and-1 changeup down and away that he also hit while firmly on balance. How many times did Price throw a 1-and-1 changeup to a lefty this year? Another rarity: just 16 times. So now I had three lefthanded hitters batting against a lefthanded pitcher in counts when a changeup could not be expected and yet all three of them were on balance for the pitch. The next day I looked at the tape. Pitching from the stretch when he threw a changeup, Price would take an extra deep breath, one where you could see his shoulders shrug, and he would hold his set a beat longer. I didn’t have access to the preferred camera angle on every pitch, but from the small sample I saw it appeared to me the Royals knew the changeup was coming when Price was in the stretch. Days later, as the series resumed in Toronto, I ran my theory past two Royals sources. Both confirmed it: Price tipped his changeup—maybe not 100% of the time, but enough for Kansas City to buy in. Conroy and Gibson are both 55-year-old former journeyman major league pitchers and now advance scouts for Kansas City. They had been watching the Blue Jays exclusively since late August. They knew every tendency about Toronto, such as how Josh Donaldson had become a more aggressive hitter as he chased Mike Trout in the AL MVP race; or how Kevin Pillar and Ben Revere had stopped being aggressive stealing bases down the stretch, perhaps simply to let Donaldson, Bautista and Edwin Encarnacion swing the bats; or exactly how Price threw his changeup out of the stretch. There was another oddity about that inning that needed an explanation: the stolen base attempt by Hosmer. Price had thrown 236 1/3 innings without allowing a stolen base this year. Only two runners had even attempted one because Price was so quick to home plate. So why would Hosmer be running when he was the potential tying run and there were no outs? First base coach Rusty Kuntz told him, “Run,” and so he did, but why take that chance against a pitcher with such fast times to the plate? Again, this is where Conroy and Gibson come in. One of the fundamentals of compiling an advance scouting report is to break down how a pitcher defends the running game, especially when it comes to his pickoff move. You take all the pickoff throws by a pitcher and look for patterns. The scouts began with this simple question: does he double up on his pickoff throws? That is, does he throw two times in a row to first base? But something odd quickly became apparent when they started this work: Price had thrown to first base only five times all year. The only pattern was that he almost never threw to first base. The next order of business was to find a clue in his delivery to home plate. If the scouts found one—and coupled with the fact Price almost never threw to first base—the Royals could run on his first movement, which allows runners a much faster jump. They quickly found what they were searching for: When Price lifted his right foot, the movement that starts a delivery from a lefthander’s stretch position, he pointed his toes down. Most pitchers pick up their foot with the toes pointed at first base. Conroy and Gibson were convinced that Price’s toes-down style made it highly unlikely he was in position to then step to first base for a pickoff throw. And that’s why Kuntz could tell Hosmer “run” against a pitcher who hadn’t allowed a steal all year, and why Alex Rios stole a base against Price in Game 6—by going on his first move. It was brilliant advance work. Now think about Friday's game-winning play: the mad dash by Cain from first to home. This is where Jirschele comes in. Jirschele, 56, the Kansas City third base coach who never played in the big leagues, had done his own intelligence work. He noticed that when there is a runner on first base and a ball is hit toward the rightfield corner, Bautista would make the long throw on the fly to second base. He alerted the Royals about this habit, and for the runner on first to be ready to be waved all the way home from first base. And then it happened. Hosmer pulled the ball toward the line. As Bautista caught it, his momentum carried him farther away from second base. Hosmer broke hard around the first-base bag with idea of trying for a double. Goins, the Toronto second baseman, floated between first and second base, neither in line with second base or home, looking a bit uncertain. Bautista turned and reached back to throw the ball not to Goins but all the way to second base, where shortstop Troy Tulowitzki was covering the base. (Hosmer had stopped, wheeled and headed back toward first.) 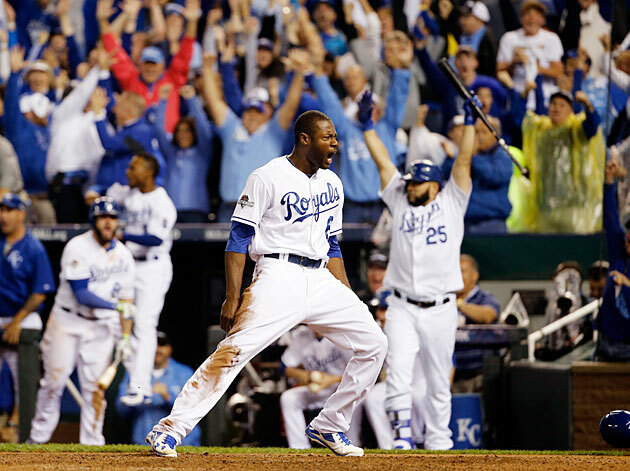 Cain—because this is how the Royals play baseball—was running hard all the way. Jirschele now had the two checkmarks he needed to confidently send Cain home: Bautista was making the long throw to second and Cain was running hard. “If he breaks it down a little bit between second and third there’s no way I can send him,” Jirschele said. “But when you have someone with the speed of Lorenzo Cain and he’s going full speed between second and third, he gets the opportunity. Jirschele is the same coach who stopped Gordon at third base with two outs in the ninth inning of World Series Game 7 last year, when a run would have tied the game. (Gordon would have been out by a week and a half.) Perez then popped out for the last out of the Giants’ win. The same man who held Gordon this time sent Cain. It immediately became one of the most important and most unforgettable baserunning plays in baseball history, right there with the Cardinals’ Slaughter scoring from first base on a routine hit (it was scored a double, but looked like a single) in the bottom of the eighth inning of Game 7 of the 1946 World Series to beat Boston. That’s so Royals—a pennant decided on a baserunning play. But the pennant also was decided by Davis striking out Dioner Navarro and Revere when a ball in play could have tied the game in the ninth—man on third and less than two outs. The pennant also was decided when Davis then retired Donaldson on a groundball—such gritty pitching after Davis waited more than an hour between his eighth and ninth inning work because of a rain delay. It also was decided by the stark contrast between the teams in hitting with runners on base. Kansas City, with its keep-the-line-moving approach based on making contact, went 5-for-13 in Game 6 with runners on. Toronto went 1-for-16 with runners on, and finished the series hitting .169 in such at-bats. It also was decided by the team with the better bullpen, the better defense and the more diverse offense. All of that you probably saw. What you probably didn’t see was that the pennant also was decided by the work of Conroy, Gibson and Jirschele before the series ever started.